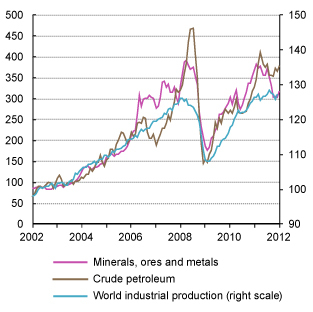 The fluctuations of commodity prices remain a central issue for developing countries. Often the collapse of commodity prices spells disaster for developing countries, since exports are needed for obtaining essential imports. But also, high commodity prices, particularly of food and energy, may be a significant problem for least developed countries Least developed countries (LDCs) are identified on the basis of low income, human assets and economic vulnerability. 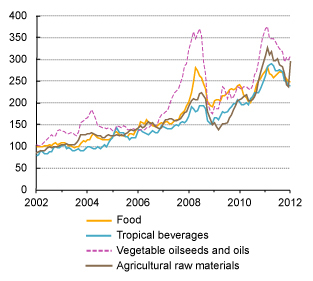 more(LDCs) creating food and energy shortages. Commodity price developments have traditionally been discussed in terms of changes in fundamental supply and demand relationships. However, there is increasing support for the view that recent commodity price movements have also been influenced by the growing participation of financial investors in commodity trading. 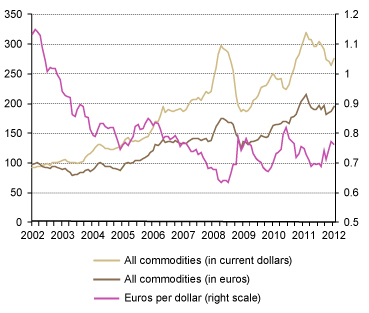 Uncertainty and instability were the major distinguishing features of commodity markets in 2010 and 2011. This is reflected in greater volatility of commodity prices than in the past, similar to the period of the commodity boom prior to the eruption of the global financial and economic crisis in 2008. The prices of commodities and some subcategories (food, metals, and energy) grew significantly starting in the late 1990s, and it is also clear that since 2006, volatility has increased considerably. After declining in the second quarter of 2010, commodity prices generally surged until early 2011, and then reversed the trend. Price increases were associated with three broad tendencies: (a) rising demand that reflected the recovery in the world economy, and, in particular, robust growth in developing countries; (b) supply shocks; and (c) the increased financialization of commodity markets. (Index numbers, 2000=100) Source: UNCTAD, TDR 2011(Chart 1.4), based on UNCTADstat Commodity Price Statistics and CPB Netherlands Bureau of Economic Policy Analysis, World Trade database Note: Price indices are in current values and world industrial production is in constant values. . Curbing financial speculation in commodity markets is central to guarantee economic prosperity in developing countries. Commodity exporters can take advantage of these relatively high prices for financing development. Government intervention through taxation or direct involvement in primary activities is essential for capturing a significant share of the generated rent. Instability Instability is measured as the percentage deviation of the prices from their exponential trend levels for the period. can be addressed through stabilization funds and countercyclical macroeconomic policies in order to avoid currency overvaluation and the generation of boom-and-burst episodes. In poor commodity-importing countries, domestic financing and foreign aid should be devoted to the development of food production and new energy sources, and to the provision of contingent finance in case of price hikes. Curbing financial speculation in commodity markets is central to guarantee economic prosperity in developing countries.